I would generally consider the ’90s to be my musical peak. Not only in terms of writing/performing (although it certainly was that), but also in terms of just listening to music. I still love music, and I still listen to music as much as I can, but it doesn’t compare to the way I went through music back then. I consumed music. Devoured it. During that time, I remember a handful of old guys (and by old I mean they were older than the twenty year old me, so I’m probably the age now they were then) who made me kind of sad. They seemed to be stuck in decades past, musically speaking. They refused to acknowledge that any good music had been made in twenty years. They thought good music ceased with the last Pink Floyd and Led Zeppelin albums. In a way, I felt bad for them. Pitied them, even. Because I knew how much awesome music there was out there to be had, and they just wouldn’t allow themselves to enjoy it. I’m never going to be like that, I told myself. I took comfort in knowing I was cool enough to recognize good music never stops being made, you just might have to do a little work to find it. So now, jump twenty years to the present. I go to put some music on, and look through my iTunes library for something that will move me. Tens of thousands of songs to choose from, and what do I do? The vast majority of the time, I put on the music I was listening to in the ’90s. Not necessarily music that was made in the ’90s so much as the music I listened to during the decade. I’m afraid I’m turning into one of those old curmudgeons who ends up walking around muttering about how everything was better back in the old days. I don’t know if it’s just my advancing age or if it has anything to do with how the music industry and the act of discovering new music has changed over the last twenty years. For instance, does anyone still listen to terrestrial radio anymore? The radio stations in my town are a pathetic joke – the only difference between the “Rock” station and the “Classic Rock” station is that the former will play maybe one song an hour from the turn of the millennium; otherwise, they’re pretty much interchangeable. I know in bigger cities that’s probably not as much of a problem, as I do remember being turned on to new bands on the radio when I lived close enough to L.A. to have an actual selection of stations to choose from. But even when I put on Pandora, I set it to help me discover new music only to skip the new stuff because I don’t like it or I ignore it until something I already know comes on. So the question remains, how do I find new music (that I actually like)? I’ve found myself going through the guide on my TV for the week, seeing who’s scheduled to perform on the week’s late night talk shows. I’ve found a couple of new favorites that way. One of the biggest finds in the past couple years for me and my tastes actually came courtesy of Last Call with Carson Daly. Yes, that Carson Daly. He takes a lot of guff, but I like the guy. I never gave a crap about TRL and I don’t watch The Voice, but throughout his career he’s always tried to introduce new music via his late-late night show, and I respect that. Thanks to him I discovered the band OFF!, fronted by the legendary Keith Morris (Circle Jerks, Black Flag), which ironically sounds a bit like a ’90s punk band. 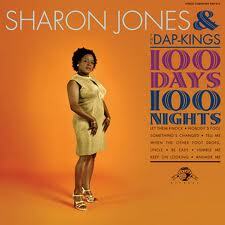 The other “new” artist I found (and can’t resist mentioning) is Sharon Jones and The Dap-Kings. I saw her on a late night show too, but it was a different TV appearance that hooked me. She had a set on Austin City Limits that I’m pretty sure left smoke wafting from my TV by the time it was over. If you have even an ounce of a liking for funk, soul, R & B, or even if you don’t – check them out. She has the voice of a funky angel, and The Dap-Kings are as tight as they come. There have been the occasional recommendations from Facebook friends, which are always much appreciated. Thanks to good lookin’ out from my friends I’ve been turned on to the spacey, trippy, indie rock of Alt-J (∆), the massive downtuned riffage of The Sword, and what I’m listening to as I write this, the rock beast that is Red Fang. I appreciate it all, and when I find something I like I eat it up, but the thing is…it’s not enough. I know there’s so much more out there, but somehow I’m missing it; this is just the tip of the iceberg. So what recommendations do you all have? How do you find new artists? From TV shows? Movie trailers? Car commercials? College radio (is that still a thing?)? YouTube? Satellite radio? Has Pandora turned you on to new artists? Somebody clue me in. As a tooting-my-own-horn kind of a side note, I logged on today to the news that I had reached 1,000 followers here on the blog. I know a lot of people have reached that number a lot faster, but I’m still floored that I’ve reached it at all. Now, I’ll be the first to tell you “followers” of the blog does not necessarily equal “readers” of the blog, as my stats can attest, but the fact remains that I am in awe that so many people have taken the time to click that ‘follow’ button, and for that I thank you. Now, back to the topic at hand. Give me your advice for finding new music, stat! Who are some of the new bands/artists you’ve discovered, and how did you find them? This entry was posted in Music and tagged '90s, Austin City Limits, Carson Daly, classic rock, iTunes, metal, music, nineties, off!, pandora, Pink Floyd, punk, Radio, Red Fang, rock, satellite radio, Sharon Jones & The Dap-Kings, YouTube. Bookmark the permalink. I put Odelay through its paces back in the day. Good album. I’ve found new artists I like through Pandora and from watching Live From Daryl’s House; the archives are on YouTube and on Daryl’s website. I like 90s music too; lots of good stuff came out then. I had never heard of Live From Daryl’s House until I read your comment. I did some looking on YouTube and I’ve got some videos to comb through! Thanks for the recommendation! Mostly from TV shows (like Breaking Bad, So You Think You Can Dance) and movies. Then I find the songs on Rhapsody or ITunes and follow the recommendations for similar artists. I got into Jace Everett that way. The theme to True Blood was so catchy I ended up getting his full-length CD. I remember back when having music on a TV show or commercial was considered ‘selling out.’ Nowadays it’s almost impossible to get noticed without that kind of exposure. Thanks for the comment! Pandora is a big one for me. I will often choose a song or group I like and make an effort to really listen, only skipping the songs I truly can’t stand. I have to either hear a song a few times or a lyric has to particularly speak to me for me to enjoy it. Movie trailers on YouTube is another go to. I also make a point to check out iTunes single of the week. Most of the time they are people I’ve never heard of. Another for me is fan videos on YouTube. Take your favorite tv show or movie and add fanvid to the search. I found the group Within Temptation through them and they are still a favorite to this day. It sounds like I need to fine tune my Pandora settings a little better. So much of the new stuff it plays is just not for me. Never head or the fanvid search on YouTube, I will definitely check that out, thanks! My younger, hipster friends actually introduced me to several of my new fave bands, The Twilight Sad, Bat For Lashes, Florence and the Machine, and !!!!. Most of their hipster likes are garbage but then there’s these gems. I don’t know how I managed to go without hearing Neko Case until my old supervisor played it in the car one day. My husband is pretty up on new stuff, what with the constant listening to Pandora and Spotify at work. But most of his likes are metal. I like some metal but mostly operatic, like Nightwish. I added some new bands to my Pandora ‘rock’ channel, now it’s playing Black Sabbath and Led Zeppelin. Apparently Pandora is trying to stunt my musical growth. I use spotify, though that isn’t available everywhere, but in spotify each band oraartist has their own page with their music but also a list of recommendations. Or similar to. I’ll use that function to find new stuff. Something else I’ll do when I have the time and patience is go through the programmes at music venues and if the description of a band or artist sounds good I’ll check them out. I’ll do the same with festivals, I’d a festival interests me in general whether I’m going or not, I will go through the line up to find new stuff. Going through show and festival lineups is a great idea! I see some of the bands listed and wonder who they are, it never dawned on me to just go straight to my browser or YouTube to look them up. So simple!